Several months ago, I posted an old shot from the Pacific Wharf back when Cars Land was still under construction. Well, times have definitely changed at Disney California Adventure, and Cars Land is now open, bustling, and wildly successful. But Pacific Wharf still retains an air pleasant peacefulness. Despite the crowds it attracts by being a hub of three different dining locations, this San Francisco-inspired area still seems to impart a sense of calmness that's becoming increasingly rare at Disneyland's sister park. And though it's small, Pacific Wharf certainly has picturesque moments! 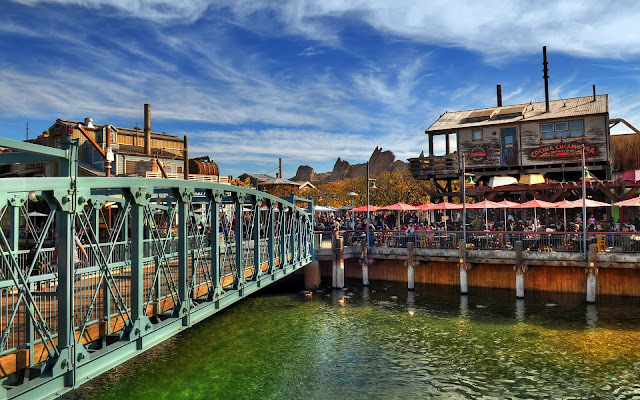 The bridge to Pacific Wharf on a bright winter day.